Despite the holiday season, there's no rest for weary resisters. This week, the GOP is trying to pull off a tax heist, the FCC is hoping to kill net neutrality, and there's an important Senate election in Alabama, so our members are still calling, rallying, and texting. We know you're busy, but hope that you'll be able to make time to take some of the actions outlined below. Our work is serious, but that doesn't mean we can't have fun doing it! Tonight, our MI Book Club is getting together over some holiday refreshments to decide what to read next. Join us to recommend a favorite book or just get some ideas for your holiday gift list or New Year’s resolution. This Wednesday, we'll be bringing cookies to our state legislators along with our thanks for the bills they've supported and some suggestions for ones we hope they'll pay more attention to in 2018. 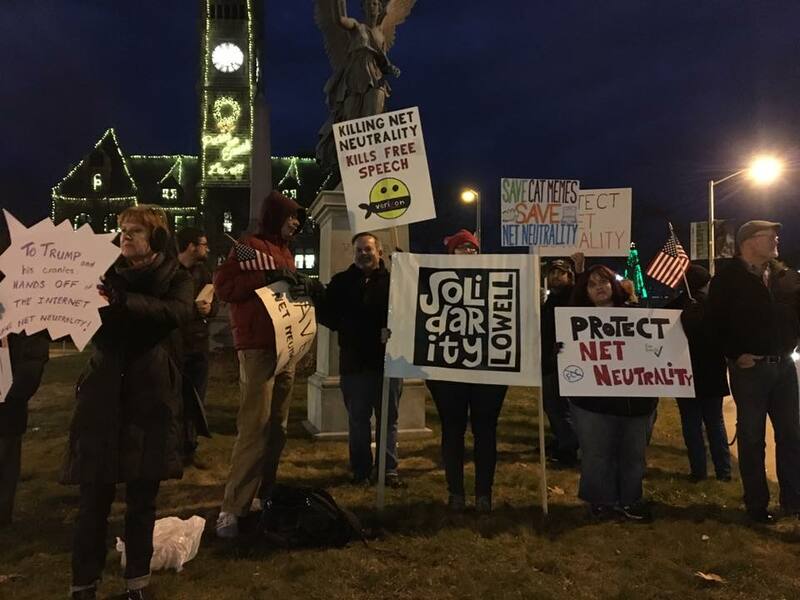 As you can see from the MI Happenings section, our members enjoyed rallying to help stop the GOP tax bill and save net neutrality this past week. Our Elections team is focused on flipping the House in the 2018 midterms. Check out our Spotlight section to learn about their work, then plan to join them at their next meeting on Jan. 9th. Check the Upcoming Meetings section for more details and don't forget to RSVP for our January events to meet the Democratic candidates for Governor. Our Recommended Reading section this week covers some of the issues our Democracy team is keeping tabs on including threats to Mueller's investigation, calls for impeachment, and state legislative activities on immigrant detainers. Wishing a Happy Hanukkah to all who are celebrating this week. 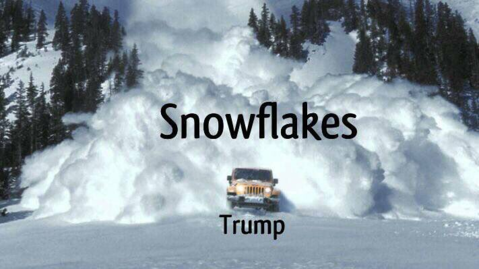 The good news is that this fight isn’t over yet! Ask them to call their Senators and representatives and tell their MoCs to oppose this bill when it comes back for a vote. 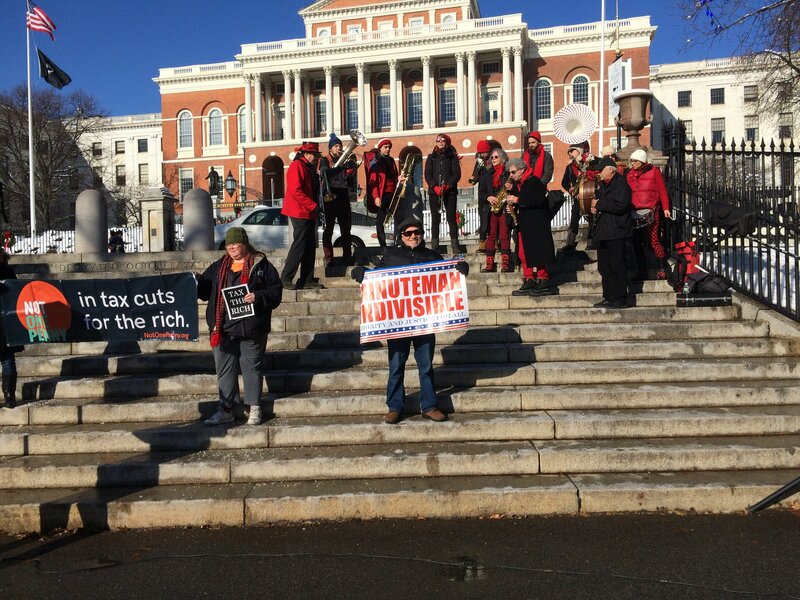 If people across the country continue to get loud, we increase our chances of defeating the tax scam. Indivisible has provided suggested call scripts and a toll-free number (1-855-980-2350) that connects people directly to their Senators. Please forward this information to everyone you know! Ask him to speak out forcefully against these proposals which will have a disproportionate negative impact on Massachusetts. We called the Governor's office the day before the Senate vote and were told that "he has not made an official statement on the Senate's Tax and Jobs bill." 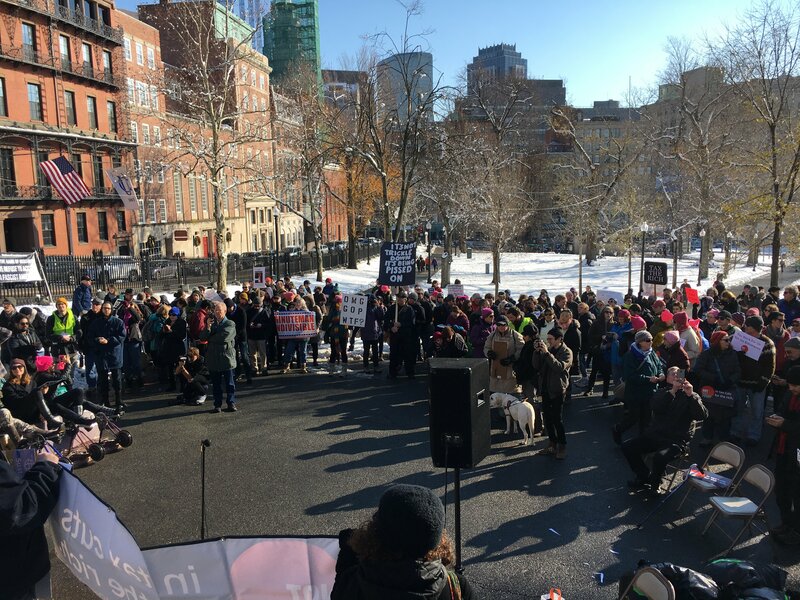 We encourage everybody to give Governor Baker a call at 617-725-4005 - he can't claim to have clout in DC and then sit on the sidelines on this issue. You can find more information and a suggested call script here. See Indivisible's website or ours and follow our Twitter account for more details on the proposals and updates on this fast moving process. Don't use Twitter? You can read our tweets on the website - just scroll down to the bottom of our homepage. This Thursday Dec. 14th, the Federal Communications Commission (FCC) will be voting on a plan to rescind the net neutrality rules that currently prevent internet service providers from blocking or favoring certain websites or content. 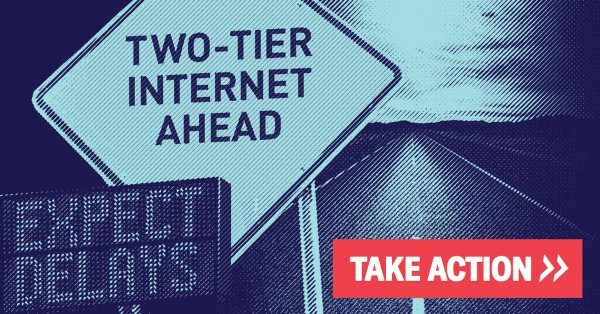 Send an email to the three FCC commissioners who are expected to vote to end Net Neutrality. This document prepared by our Democracy team provides their email addresses and a sample script you can use as well as information on other actions you can take. Visit this website for information on how to join the online protest on the Dec. 12th Day of Action. Our MoCs oppose this change - please call to thank them and add your voice to theirs. Contact Senators Markey & Warren and your Representative and ASK them to vote NO on any Continuing Resolution (CR) that does not provide adequate and long-term funding for CHIP. It is not acceptable that healthcare for children be sacrificed in order to give tax cuts to the already-rich. And THANK them for voting NO last week on the CR that did not include funding for CHIP or DACA (Deferred Action for Childhood Arrivals). 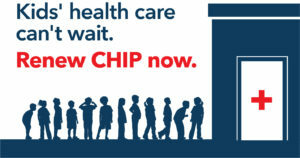 See this document prepared by our Healthcare Team for more information about CHIP and the current funding crisis. We applaud Governor Baker for sticking up for CHIP - it is a moral imperative to provide health insurance for children. But supporting fundraising for Roy Moore is not sticking up for children and it is certainly not consistent with our morals. Granted, Governor Baker has come out against Roy Moore BUT raising money that goes to the RNC, which goes to Roy Moore, is wrong. Please call Governor Baker and tell him to end this agreement with the RNC as other Republicans have done. 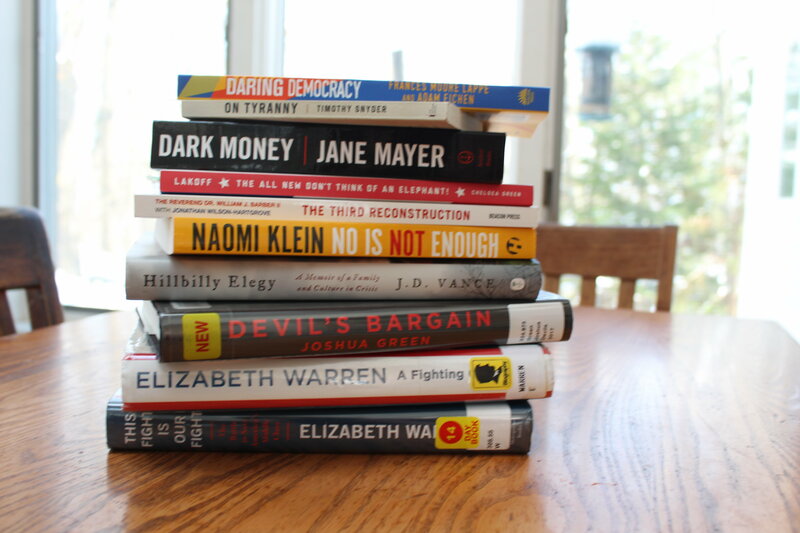 We've received lots of suggestions for great books to read next - help us decide which ones to begin discussing in 2018. Recommend a favorite or just get some ideas for your holiday gift list or New Year’s resolution. We'll have copies of the books we've already read and some of the ones we might read next available for you to look at. 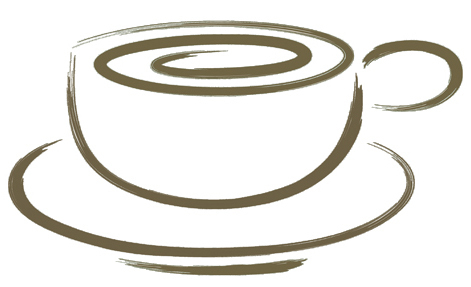 Join us for a lively discussion and some special refreshments. Newcomers are welcome - you can RSVP using this link. Ok, not storming but instead spreading kindness. 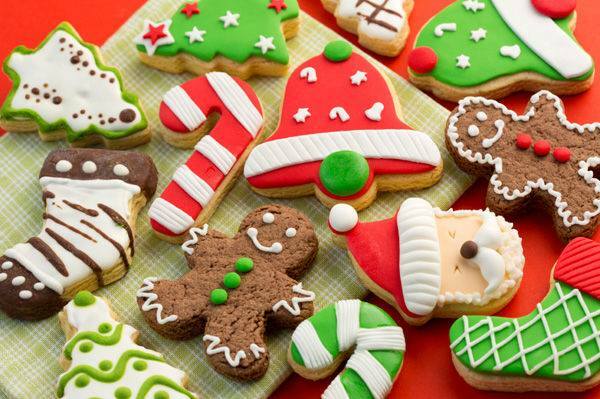 This Wednesday, Dec. 13th, they'll be bringing holiday treats to our State reps and senators and their staffs. They'll also be including letters and cards to thank them and ask them to champion issues that are important to us as the legislative session continues in Massachusetts. New members are always welcome! If you want to join in the fun, sign up using this link. 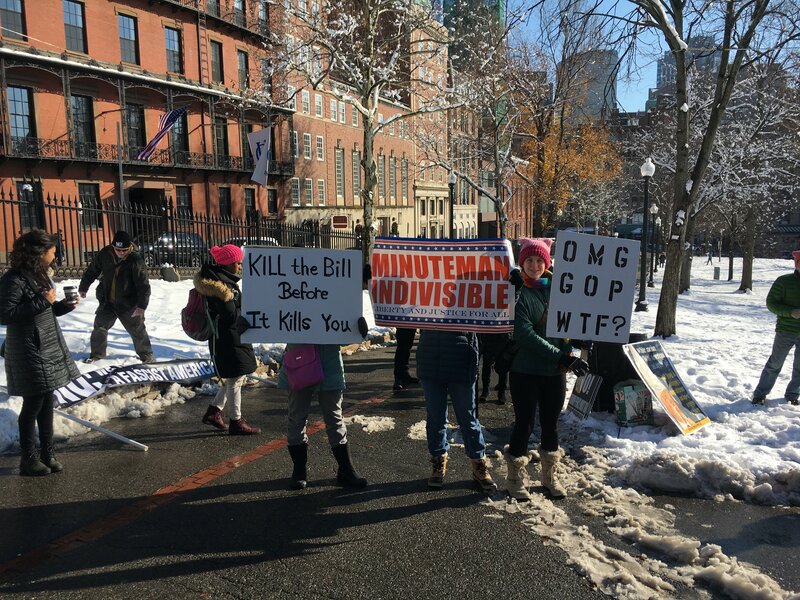 A large and very visible contingent of Minuteman Indivisible members showed up for the "Stop the GOP Tax Bill" Rally on the Boston Common this past Sunday. Check our closed Facebook page for more photos and a video of the band provided by one of our members! 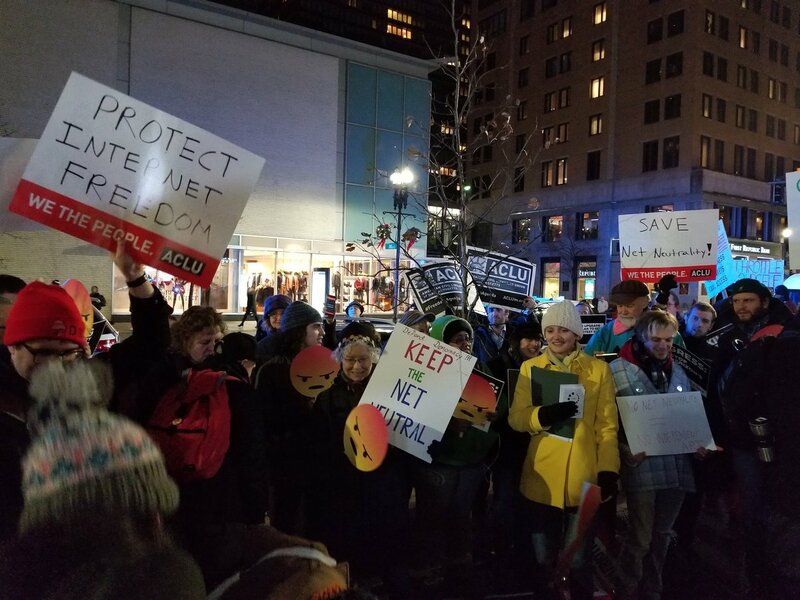 There were nationwide protests at Verizon stores on Thursday December 7th to call attention to the FCC's plan to gut net neutrality. 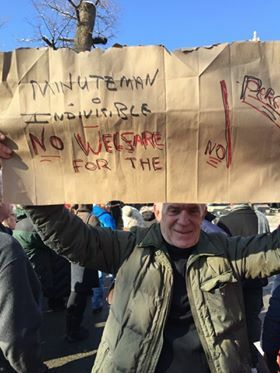 Locally, members attended protests at Verizon stores in Boston and Lowell. Elections Team is Focused on the Midterms! Think the midterm elections are a long way off? Think again! THIS is the time to make an impact on shaping the races in flippable districts, and the Elections Team is hard at work doing just that. At our December 5th meeting, we discussed specifics about researching the issues that matter and the weaknesses of incumbents in our chosen districts. We announced our support for a fourth candidate, Amy McGrath in Kentucky's 6th district, and we reviewed strategies for our ongoing fundraising work. We'll be meeting monthly through 2018 to keep up the support for our candidates - join us! We've received lots of suggestions for great books to read - help us decide which ones to begin discussing in 2018. Join us for a lively discussion and some special refreshments. You can use this link to RSVP. We'll be bringing holiday treats to our State reps and senators and their staffs along with letters and cards to thank them and ask them to champion issues that are important to us. We'll be meeting in East Arlington and taking the T into Boston. Let us know you're joining us using this link and we'll get you directions on where to meet us on Wed. morning. All are welcome for the next Healthcare meeting. We will be discussing where things stand with the ACA depending on the results of the tax bill, and other implications for healthcare nationally and locally. Join Rep. Kaufman for this session on Health Care Policy: Diagnosis, Prognosis with his guest, Amy Rosenthal, Executive Director of Health Care For All. Questions can be submitted in advance by email, jay.kaufman@mahouse.gov, or you can tweet your questions to @repjaykaufman. Join the Elections Team for a working meeting. Bring your laptop and learn how to research specifics about the issues that matter and the weaknesses of the incumbents in our chosen districts. Learn the ins-and-outs of amplifying our candidates' messages on social media. All are welcome! Candidates Jay Gonzalez and Bob Massie will be speaking and answering your questions. This event is free, but space is limited, so please RSVP using this link if you plan to attend. Setti Warren will be speaking and answering your questions. Space is also limited for this event, so please RSVP using this link. Last Wednesday, the House voted on a resolution to impeach Donald Trump. While the motion to table the resolution was approved by a wide margin (364-58), four members of the Massachusetts delegation (Capuano, Clark, McGovern, and Moulton) voted to advance the resolution. The Democracy Team is sending "Thank You" cards to all 58 MoCs that supported this resolution. Several organizations, including Need to Impeach and Impeach Donald Trump Now have online petitions urging impeachment that have been signed by millions. Last month, Weston MA joined 17 other communities (including Brookline, Cambridge, and Newton, MA and Los Angeles and San Francisco, CA) when its town meeting approved a resolution calling for President Trump's impeachment. In preparation for that vote, the Weston League of Women Voters held an excellent information session. We encourage you to watch the video of this session using this link and form your own opinion as the drumbeat for impeachment gets louder. The MA House upheld the ruling of Acting House Speaker Patricia Haddad that prohibited consideration of an amendment to the Criminal Justice Reform Act that would authorize police officers, court officers, and other law enforcement officers to detain a person under certain circumstances at the request of ICE. The amendment was filed in response to the July decision by the State's highest court. Haddad ruled that the amendment was not properly before the House because it was not included in any earlier version. The vote was 119-34 and Reps. Kaufman and Garballey both voted with the majority to uphold Acting Speaker Haddad's ruling.